: Latest Update: Common Core progression-tracking! Grades and GPAs are just rough estimates. It's more important to keep track of which skills your students have mastered. That's where Common Core-aligned progression tracking comes in. It's a big deal. Most of us have had this skeptical suspicion: Am I aligning my curriculum to Common Core just because some bureaucrats said I have to? If that were all that was behind Common Core, then it would absolutely be a waste of our time. Only at this high-level view does it all start to come together. The overarching goal is to enable apples-to-apples comparisons that can then be used to drive stage 4 where every teacher in America is creating interchangeable exercises and materials. We're looking at a student's results across three Common Core-aligned writing assignments. Each row is a different Common Core standard. Each column is a different assignment. Gaps in the chart mean that the particular assignment did not assess that standard. The chart includes a trendline and overall progress. 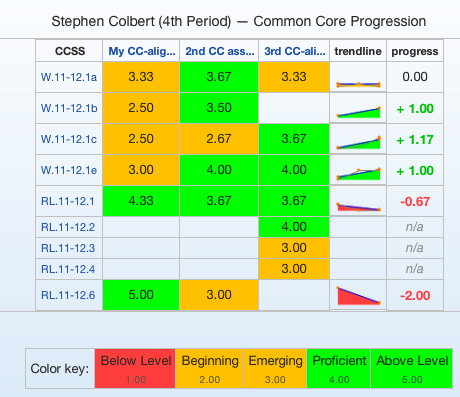 We get a detailed look at the exact Common Core standards that Stephen is improving on but also where he's stagnating and even where he's regressing. This sort of breakdown is much more detailed than simply tracking his grade in the class. He's probably a B+ student, but clearly he has certain skill areas that could use more focused help. Now imagine that his school's writing center or, even better, next year's teachers can access this data. They won't have to re-diagnose his abilities to see where he needs help, nor will they see his B+ grades and assume he's doing just fine. He can even transfer schools--out of state, even!--and his new teachers will understand where he's at because everyone is using the same structure via Common Core. Math teachers are leading the charge for this skills-based mastery model. The fact that a student is getting a C in Math tells us next to nothing. We need to know exactly where she's struggling, diagnose why, and develop specific remediation strategies. Life in the English and Social Studies world is a bit more complex--you can't completely isolate a specific composition skill away from the essay as a whole--but the basic theory is still sound. And framing this all within Common Core means that we'll be able to search for RL.11-12.6 remediation exercises to help Stephen improve. We can actually start sharing materials and have a common organizational backbone to work from. This is what I mean by apples-to-apples comparisons; RL.11-12.6 means the same thing in Boise, ID as it does in Baton Rouge, LA. Your amazing exercise for a particular standard can be shared and used everywhere. But this is just the beginning. All of this apples-to-apples data opens up the possibility of meta-tracking and meta-analysis on increasingly large scales. How is Stephen progressing relative to his peers? How is this year's sophomore class progressing relative to last year's sophomores? By the time our seniors graduate, how do they stand relative to other seniors across the entire country? We do not yet have this sort of meta-analysis in place, but the hard part is done. We are already collecting the necessary data. You, the instructor, determine all of these scores, but without putting in any extra work. Seriously. This is the magic of EssayTagger. Remember that EssayTagger kills two birds with one stone. You create your own feedback comments for each rubric element (e.g. pointing out a common flaw in a thesis). But you also organize that feedback comment under a particular quality level (e.g. "Emerging"). So when you apply that comment to an essay, the system is able to record your quality level assessment of that rubric element (e.g. a "Proficient" Thesis, "Beginning" Evidence, etc). We take those evaluations and turn them into a simple numeric system, as identified in the "Color key" at the bottom of the chart. It lists the rubric's possible quality levels along with each level's color coding and point value. EssayTagger makes it easy to create Common Core-aligned rubrics so all you have to do is create feedback comments and grade papers through our time-saving grading app. You save time grading essays since we've eliminated the annoying repetitive manual labor aspects while the system automatically saves and tracks your evaluation data. You grade. We crunch the numbers. Life is good. 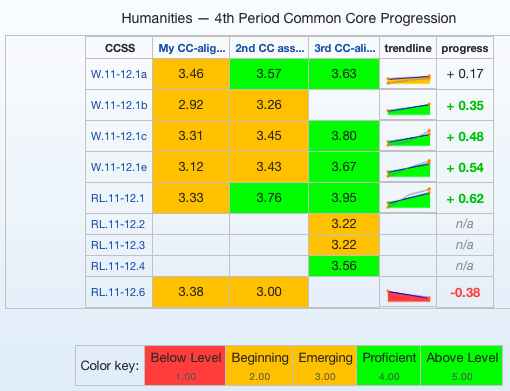 The new Common Core-aligned progression tracking charts shown here are already live on the site and available to all EssayTagger users. This should be obvious, but it will only display assignments that used a Common Core-aligned rubric. Free trial users are limited to one assignment (and up to 99 graded essays) so you won't be able to see progression data across assignments until you move up to a paid account.